IPCW Headlights are the perfect solution for your vehicle. Whether you�re looking to replace a dull or broken headlight assembly, or you�re trying to get the look of custom headlights, IPCW Headlight assemblies are the answer. IPCW Headlights are all SAE/DOT/FFVSS-108 compliant, meaning they�re not only street legal, but they are also superior to most of the competition. IPCW Headlights fit as well as factory headlights and are built to last. Their gaskets seal better, they have a sporty and unique look, and they outperform the competition.When you order a quantity of one, you are ordering one pair of IPCW Headlights for your vehicle.. 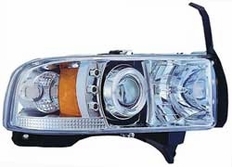 The part number for this Pair of IPCW headlights is: CWS-401C2 and they fit 1994-2001 Dodge Ram models.